The latest version of our bolt-on fork valving system for cartridge forks. Gold Valves significantly improve the flow over stock pistons, putting valving control on the shim stack instead of the piston. This results in outstanding tuneability, improved control, traction, plushness and bottoming resistance. Includes detailed online instructions, Gold Valve Pistons, Valving Shims, and access to the Digital Valving Search (DVS) which provides specific valving stacks for your exact weight, skill and riding conditions. Note: Standard Gold Valve Kits are Compression Kits. 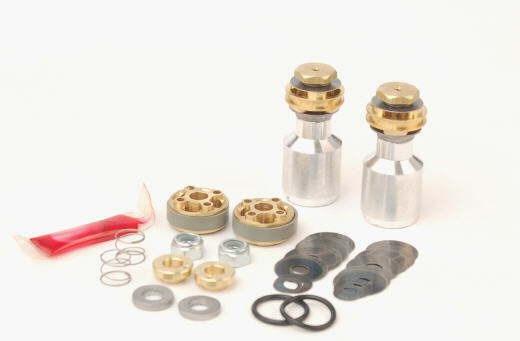 Combo Kits end in "C" and include both Compression and Rebound Gold Valves.